Coin and currency collecting as a hobby goes back hundreds of years. It was mainly a hobby of kings or other very rich persons who could afford to save not only new issues but also obtain older issues and issues from other countries. By the 1900’s, however, numismatics was be-coming a hobby of the common man. 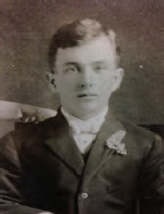 In 1900 at the age of eleven my great grandfather Ernest Hack started collecting coins and paper money. Then in 1910 he opened a coin and stamp shop in Detroit MI. This was a very unusual business for that time period especially for a 21 year old. 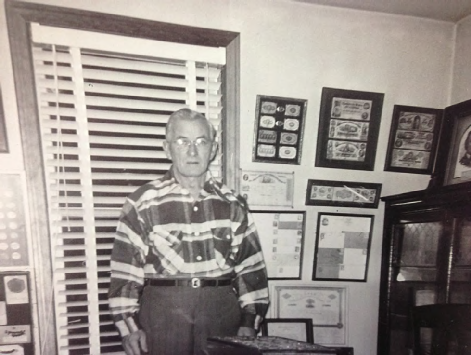 However his business flourished and he was in business sixty one years! With only two national organizations for numismatists at that time (ANA and ANS) it was harder to reach collectors. But Ernest achieved success by corresponding with collectors and dealers all around the country by mail. 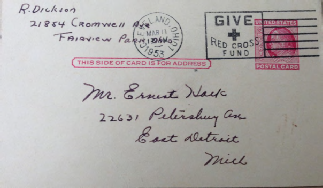 I have an envelope, known as a cover by stamp collectors, which Ernest mailed in 1914. I have seen one from 1912 in another collection. 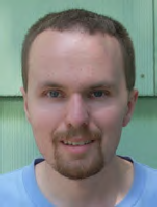 In August 2013 I went to a family reunion of the Hack family. One of my dad’s cousins told me to follow him to his car as he had something to give me. It was a file box that looked like a large book. It also looked rather old. He said “This belonged to Ernest, and I know you will enjoy it.” I thanked him and placed the box in my car. When I re-turned home I could hardly wait to open the box and see what I had. It was a box of Ernest’s correspondence with dealers and collectors from around the country through-out the 1950’s! How exciting! Ernest was mainly interested in buying and trading obsolete bank notes (pre-Civil War notes issued by small banks from around the country). He was also interested in hard times tokens, and some coins evidenced by one letter asking about early large cents. It is truly amazing to read these hand written or typed letters which give me the opportunity to see how numismatic business was conducted in the 1950’s but also how low (by today’s standards) prices were then! From reading the letters and post cards I can see that it was standard practice to send large groups of notes to people on approval. In some cases it took a while for Ernest to get the notes back, or to get paid for the notes when the person wanted them. My first thought was how he might not have a large part of his inventory available when he had a local collector interested but several groups of notes were out on approval. This is very different from today where a collector can go to a dealer’s website, look at pictures of a coin or note and buy it with their credit card or PayPal and receive it within days. Is this new system better? Many may think so but I think the personal correspondence is nice. The way people wrote is fascinating to me. They took the time to sit down and make dealings personal. That’s lost in today’s cyber world. If today’s collectors were offered notes for the prices at which my great grandfather bought and sold them, we would order by the thousand! For example, four-note sheets of New Orleans bank notes could be had in the 1950’s for $1.50! Now the price would be closer to $150. Many obsolete notes sold for 50 cents to $1 each. In some cases notes described as rare were offered for $7 each. It is simply amazing how much prices have increased in the past 60 years for these obscure numismatic items. Large cents from 1800 to 1813 graded “Very Good” were priced between 50 cents and $2.50 each depending on the date. Again, collectors today would stand in line by the thou-sand at those prices! important letter writing was to convey to the customer the owners’ appreciation for the customers’ business. Letter writing has become a lost art for the most part today. Email just doesn’t convey the same sentiment that a letter does. A letter is more personal and shows more effort on the senders’ part. Because writing was the main means of communicating, many dealers and some serious collectors had fancy stationary printed to conduct business. Many only had their name, business name, address, and in some cases what they dealt in. Others also had pictures of coins on the stationary. Some of the stationary is just as interesting as the information written on it. My great grandfather’s stationary was actually printed circa 1913 and was still used in the 1950’s.His stationary listed him as a dealer in “coins, stamps, paper money, Indian relics, handguns” However he would regularly cross off Indian relics and handguns in his 1950’s correspondence. 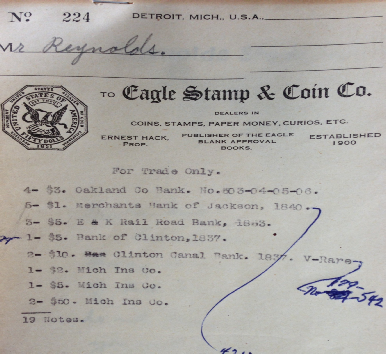 His invoices were just as old, and listed“coins, stamps, paper money, curios, etc.” as items he dealt in. From his letters it’s clear he was mainly interested in the obsolete notes by this point. If you are ever able to acquire numismatic correspondence from the 1950’s or older, do so! They will provide you with hours of enjoyment and will prove to be amazing for the information they contain! These are relics from a bygone era when business was done slower, and on a personal level. They are not valuable in a dollar sense, but are priceless in a historic context. They allow the modern reader to peer into transactions from years ago and learn how this great hobby has evolved. Happy reading!